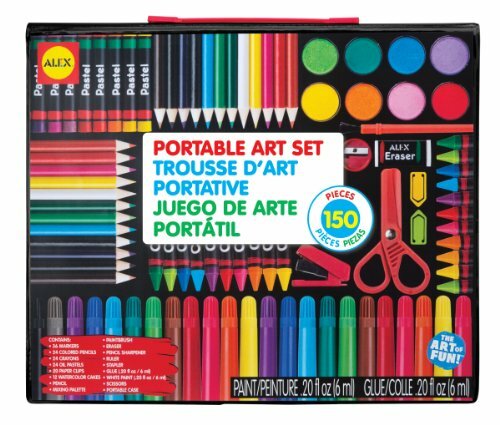 ALEX Art Portable Art Set will introduce children to the creative world of art. This 150-piece set comes complete with watercolors, pastels, colored pencils, a paintbrush and more all held together in a convenient carrying case. It's a great way for a young Picasso to try a wide range of mediums and decide which they like working with best. Every piece has a specific spot, so the artist can remain organized and the case has a handle, so the mobile studio can easily move from room-to-room, house-to-house or class-to-class. The Portable Art Set includes 12 watercolor cakes, mixing palette, paintbrush, 36 markers, 24 colored pencils, 24 crayons, 24 oil pastels, 20 paper clips, pencil, sharpener, eraser, ruler, glue (20oz. ), stapler, scissors, white paint (0.2oz. ), and carrying case with handle. Recommended for children 3 years of age and older.